The Queen Adelaide | Pub Quizzers | Find a pub quiz near you, now. 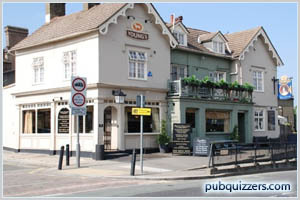 Pub quizzes take place at The Queen Adelaide, Wandsworth on Wednesdays (weekly) at 20:00. Entry is £2.00, you can have up to 10 people on a team. There are prizes of spot prizes, cash, drinks. Happy quizzing! Top quality questions in a huge mix of subjects. No team size limit but more than 6 people incurs penalties.